These structures are an awesome new design being developed by Shady Places. 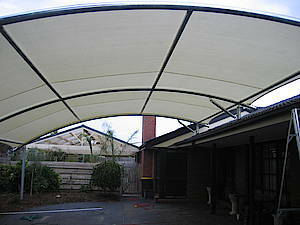 And as this photo shows, they are one of the best looking and most efficient Shade Sails available. Rolled Steel Structures will enhance the look of your home or business, as well as offering great UV and rain protection. Contact Shady Places to find out how a Rolled Steel Carport or Pergola will improve the look and value of your home or business.